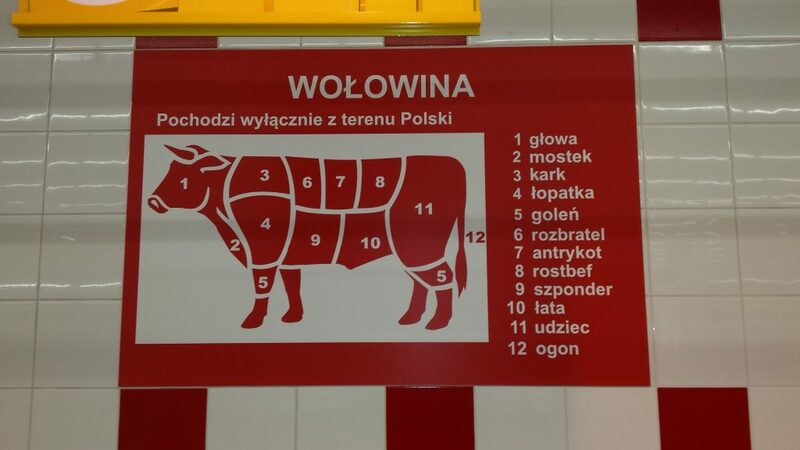 A description of the parts of meat in a Polish grocery store. As far as customer service goes, America wins hands down. There simply isn’t a better place I can think of where the customer is treated respectfully and professionally. The bar is set so high in fact, that a poor experience can be met with severe penalties. Despite my criticism of the medium, I must cede that social media has one positive benefit in that it offers far more transparency to consumers than ever before. In a recent example, consider how quickly word spread about the United attendant who forcibly dragged a customer off the plane. Restaurant service in most of Europe is average at best when compared to American standards. Before delving into the details, bear in mind that wait staff are paid a general wage in Europe, which is why they happen to love American tourists who always overcompensate them. The quick travel tip here is that aside from a luxury restaurant, 10% is the way to go. The further you east you venture in Europe, the worse the service becomes. In a restaurant setting, the server will do the bare minimum to assist you, and in many cases you have to physically chase them down if you want something extra. A major difference that I encountered on numerous occasions relates to the menu. Unlike America where the choices on the menu almost always reflects what you can order, as you go head further toward Central and Eastern Europe you should always have 2 choices in mind. Many times they simply don’t have what you want and make no apologies for this. I’m sure we’ve all had the misfortune of dining next to one of those annoying guests who assume that upon entering the establishment they are now crowned royalty, the king and queen who will shortly be served upon by the peon staff, whose sole duty in life was to serve them food. The kind of customer who almost go out of their way to complain about things most of us look over, and of course are miserable the entire time. I would truly relish the look on their face if I were to plop them down into a Polish or Czech restaurant after the server would tell them they don’t have the steak 🙂 Even better, consider an experience I had in the Czech republic. For whatever reason I wanted to order fries and rice, not the best combination but as an American we can do whatever we want (notice how entitled that sounds?) Not at this restaurant. The waitress refused on the grounds that it didn’t go together. Once again, imagine just for a moment if your server ever denied your order, even if it wasn’t a good combination? 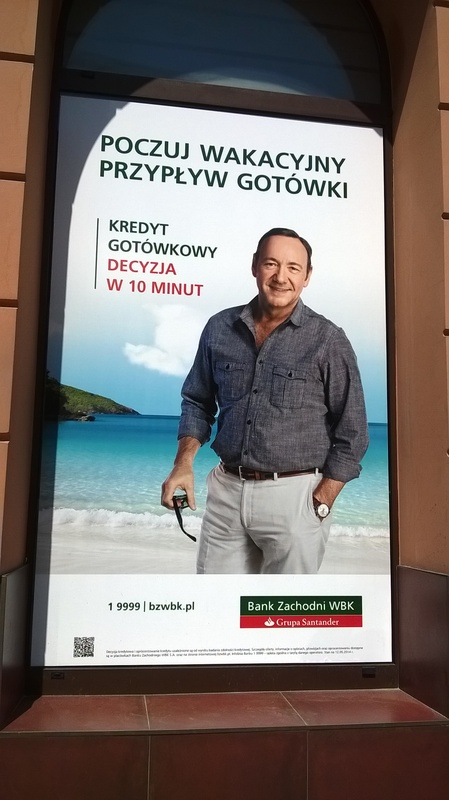 Prior to the scandals, Kevin Spacey’s likeness could be found promoting banking services in Poland, ironically this was during the House of Cards seasons. As you head away from restaurants into daily life, it only gets worse, especially in a place like Poland. When I first moved there I made the mistake of opening an account with the state bank. One couldn’t think of a better example of how the remnants of communism still live on to this day in Poland. At first I was quite optimistic as the amount I wanted to deposit made me a VIP customer, so I got to use the special queue. This still resulted in a 45 minute wait. Imagine if I weren’t a VIP? I’d probably still be waiting in line 🙂 What’s more frustrating is while you stand there in line wasting your life away, there were about 3 – 4 employees milling about in the background, doing God know’s what. This is a common theme in many establishments in Eastern Europe, where the customer never comes first. Now, I wouldn’t expect all of them to be trained in service, but what’s more important? Once again this is very much the American approach. My banking experience only got better as the woman asked me how much I wanted to deposit. When I explained I didn’t count it up because there was a money counter sitting right next to her, she gave me a grim look and took the money. One thing to mention is that anything you do in Poland related to banking involves many stamps and plenty of paper. On that note, if you want to travel back in time, go no further than a Polish bank where the slogan should be: “For over 30 years, we are still living in the 1980s” You’ll encounter long lines, in some branches you can’t do what you want, many things cannot be done online, and you always need to sign everything twice. So after making my cash deposit, I received a deposit slip which was aggressively stamped in about 4 places, a couple less than on your passport when you enter another country. Can you ask yourself, my fellow readers, the last time you received a deposit slip from your local bank teller? I feel the level of service quality in America is most evident when comparisons are made to the DMV and post office. In this regard, my experience in post offices in the many countries I’ve visited throughout Eastern and Central Europe haven’t been so bad, only because the bar was set so low from the start. I have found that when you get away from the regular service desk, those working at the stamp vending areas can be quite nice. 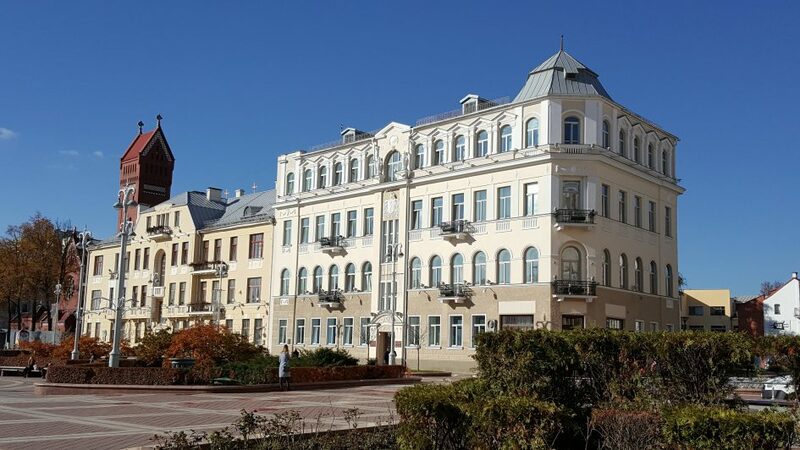 In Belarus I had a positive experience. Also, in Frankfurt, Germany I met a very knowledgeable man who went at lengths to show me all the collections. In Poland, I did have a quite shocking experience. One of the packages I wanted to ship was put on hold because the clerk undercharged me. She said that either it would come out of her pocket (about an hour’s worth of work) or I could come back to pay. So much for the benefits of state run enterprises! No matter where you go, grocery stores in Europe are simply awful when set to American standards. To start, not all, but many make you weigh and put a sticker on your own produce. Being stubborn in my ways, I either don’t buy from these stores or get the bulk packages that have a sticker on them. What’s even more annoying about this process is that the weighing machines are never logical, which often causes me to ask for help to find the item I want to weigh, all the more reason it is better for the checkout clerks to do this. Secondly, bags are not free in Europe, which isn’t a big deal but not something all Americans are used to. Third, because Europe has less space, you will find less choices in grocery stores and far less room in the aisles. Finding something often requires asking someone else to move out of the way and moving around a carriage is like playing an adult version of bumper cars with the other shoppers. Because of this, you cannot easily get around stores as you do in America. Ever more challenging is that grocery stores have an over proportion of the two groups of people who seem to be constantly in your way: families and the elderly. At home I can breeze through a target at a professional speed walking pace while in Europe I have to muster far more patience to get where I need to go. Checking out happens to be the most stressful part of the grocery process because nobody helps you to bag your groceries. It’s customary to simply shove the items across the way, often mixing them in with the person who just went before you. If you are by yourself it requires a certain skill that I’ve now developed as you must plan the bagging in advance but also be quick enough to pay, then collect your change, all before the next person’s items get mixed in with yours. On top of all of this, check out clerks in grocery stores are rarely friendly. Only in rare occasions is small talk made, sometimes slightly more often in my case as they see me struggling with the local language. Having lived for many years in Krakow, Poland, one of the biggest complaints is service. Once again, the ghosts of communism still haunt the country in the lack of customer service, simply because it is a new phenomenon. I learned very quickly to loathe any experience which required me to call a phone line for help. In many cases they will simply hang up on your if you don’t speak Polish well enough. I had one situation in particular where I just had my Internet installed in a new apartment. Something had to be activated that wasn’t. When I called the service line the woman who answered hung up on me. When I called back again she explained that an English speaking person would call me back but wouldn’t say when. I ended up calling a third time, got the guy who spoke English and he fixed the problem in 2 minutes. They had to be sitting in the same room, but the mentality in Poland is to get you off the phone, no matter how. Granted, I should know how to speak the language better, but as you can see, Americans are quite spoiled, the best example being what you hear when you call any support line, having the to dial numero dos for help in Espanol. I’m of the opinion that Eastern and Central Europeans enjoy waiting in lines. If you ever live in one of these countries, it’s something you’ll need to adjust to as it is a black swan event to walk into a store, find what you want, and pay immediately. Although it is slowly changing with express lines and automated check outs, in most cases you’ll be forced to wait. The craziest example I can think of was a grocery store in the Krakow train station, where the line wrapped around the corner into one of the aisles. Although the line did move along, I could never fathom an experience in the US. Despite the criticism I’ve levied, which has often been harsh at times, the best way to appreciate what you have is to experience something different. Safe travels!